I was recently invited to write the foreword to a new textbook on cochlear implants and implantable hearing devices, and in particular asked to give some historical perspectives. When such a task is requested it perhaps signifies that you are considered “senior” in the field. Or maybe it is another way of saying you are old and can remember back to the dawn of events. Prior to my own era, there were a number of studies involving the electrical stimulation of the ear (e.g. Volta [in Italy] 1790; Lundberg [Sweden] 1950; Djourno & Eyries [in France] 1957) but these experiments did not involve the concept of implantable electrodes. The first use of implanted electrodes was pioneered in the sixties and seventies independently by US and French teams. At the House Ear Institute in Los Angeles, William House developed and implanted single channel cochlear implant devices, later manufactured by 3M. Also, at that time in California (Stanford University), Blair Simmons developed a six-electrode array for cochlear implantation. In France, a team led by Chouard also developed a stimulator with multiple intracochlear electrodes. 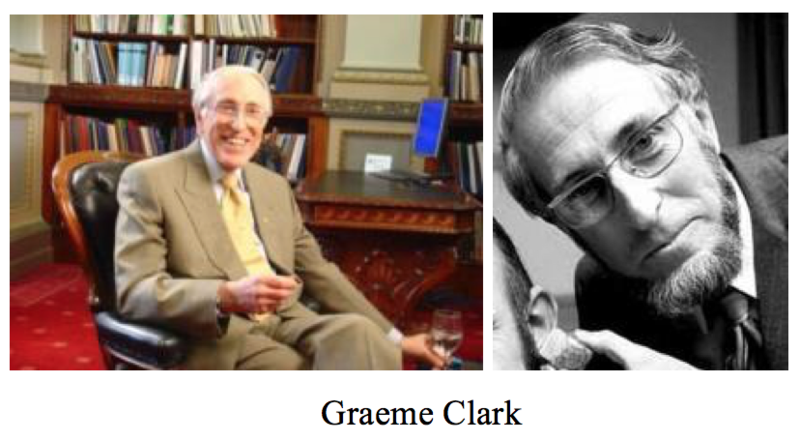 However, the big leap forward came from the undisputed grandfather of cochlear implants, Graeme Clark. Working in Melbourne, Australia he carried out comprehensive studies and published a series of papers1–3 dealing with the rationale for cochlear implantation (CI) in the severely deaf subject, the development of a multichannel electrode array, and the surgical approach for cochlear electrode insertion. By the late seventies, Graeme Clark’s team was poised for the final translational step from the lab to the clinic – the manufacture and commercialization of the device. This is the big step that requires significant financial backing, and for the Melbourne team this funding came from the Australian government. This is exactly when I personally witnessed history in the making. In 1977 I was in the Department of Communication and Neuroscience at Keele University (UK) finishing my PhD thesis research. At this time Graeme Clark was visiting Keele to get some insights on how best to program the stimulation of cochlear electrodes to transmit speech information. Late one evening, he burst into my lab and explained that he had just received an urgent telephone call from Australia. His news was that his government has approved substantial funding for the manufacture and clinical application of his cochlear implant device. The next day he hastily returned back to Australia, and as they say in the movies, the rest is history. In Canada, I have been involved with much of the early research, and the clinical adoption of CI. In the early 80’s I took leadership of a national project consortium: eight labs across Canada funded by CIHR (then called MRC) involved in basic research, device component development (electrode array, electrical stimulator and speech processor) and clinical trials. Dr. Julian Nedzelski was part of the team and he took the clinical lead and started up the first adult cochlear implant program in Canada. 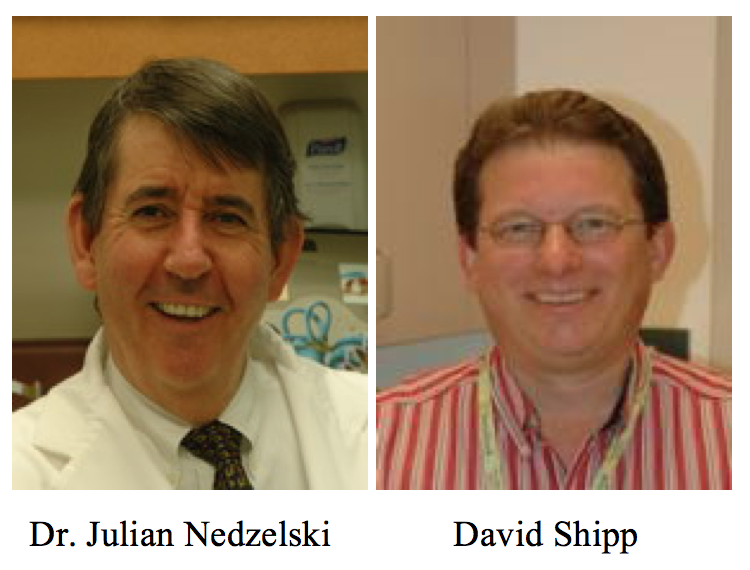 At Sunnybrook hospital he was ably assisted by the first CI audiologist in Canada, David Shipp. In the mid-nineties, Julian and I initiated and nurtured the pediatric cochlear implant program at SickKids,4 later to be directed and grown by Dr. Blake Papsin. These early years were not easy sailing. There were funding problems and resistance from the Deaf community (including charges of cultural genocide). These were also times of changing criteria for CI candidacy and changing FDA (and Health Canada) rules. I could write pages about developments from those early days to the present time, and perhaps I will in future columns. For now I will offer the opinion that CI served to revitalize audiology and otology worldwide. The achievements have been profound. Worldwide over a third of a million people have benefited from a restoration of hearing and an improved quality of life. One hundred thousand congenitally deaf infants have developed near normal speech and language abilities. This is only part of the success story. The advent of CI spawned a huge scientific and technological interest in the field of auditory science and has been a huge boost to the hearing health care professions including audiology and otology. Clark GM. A hearing prosthesis for severe perceptive deafness - experimental studies. J Laryngol Otol 1973;87:929–45. Clark GM. A surgical approach for a cochlear implant: An anatomical study. J Laryngol Otol 1975;89:9–15. Clark GM and Hallworth RJ. A multiple-electrode array for a cochlear implant. J Laryngol Otol 1976;90:623–27. Harrison RV, Nedzelski J, Papsin B, Russell S, Margar-Bacal F, Ross D, Papaioannou V, Picton N, Lockyer L, Ingrams J, Barnett S. The cochlear implant program at The Hospital for Sick Children. J Otolaryngol 1997;26:180–87.